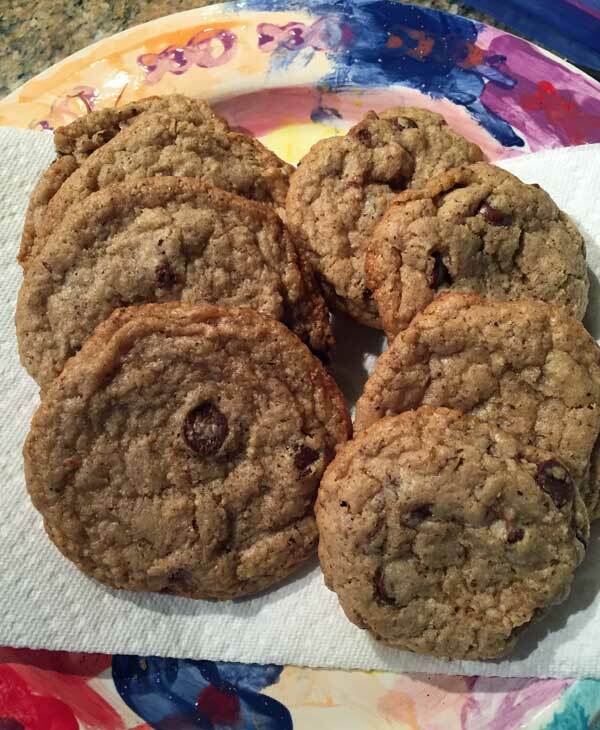 I found this wheat free oat nut chocolate chip cookie recipe back in 2008, so in some ways it was a little ahead of its time. Now there are hundreds of recipes for gluten-free cookies, but I still like this one because it’s made with things I usually have around the house — oats, hazelnuts and almonds. The catch is they have to be ground into flour. All three types of flour can be found at the grocery store, but unless you plan to use those flours for other things, it’s probably more economical to just grind the oats, hazelnuts and almonds yourself. For this batch I ground the oats and hazelnuts, but used some almond meal I’d stored in the freezer. Overall, these were pretty easy — especially since I’d been using the processor all week and had it out and ready to go. As for taste and texture, the cookies were chewy with crispy edges and not overly sweet. The ones on the left of the plate were made with dough straight out of the bowl and the cookies on the right were made with dough that had been shaped into balls and chilled. If you want nicer looking cookies, I recommend chilling the shaped dough balls. Wheat Free Oat Nut Chocolate Chip Cookies are made with ground oats, hazelnuts and almond meal. Preheat the oven to 350 degrees. Line two baking sheets with parchment paper. If making dough ahead of time you can skip this step. In the bowl of a food processor, grind the oats to make 1 ½ cups oat flour. Empty oat flour into a second bowl and grind the hazelnuts to make 1/2 cup of hazelnut flour. Add the hazelnut flour to the oat flour, then add the almond meal, baking powder and salt and whisk until thoroughly mixed. Process the butter and both sugars in the bowl of the food processor, then add the egg and vanilla and process until smooth. Scrape sides of processor bowl and add the nut flour mixture, then pulse to make a dough. Empty into a bowl and stir in the chocolate morsels. Drop by tablespoonfuls on baking sheets; bake one sheet at a time for 12 to 15 minutes, until lightly browned. Transfer to a wire rack to cool completely. Alternatively, drop the rounds onto a foil lined plate, chill for several hours, then shape into neater more compact balls and bake for 12 to 15 minutes. Adapted from "Cookies for Breakfast: A Teen's Not So Bad Guide to Wheat and Gluten-Free Baking". I used to really hate working with hazelnuts because the method of roasting them in the oven and then trying to remove their skins with a dish towel… That just doesn’t really work! I did notice that Trader Joe’s sells hazelnuts where most of the skins are already off. But I also found a tip that really really really works! You bring some water to a boil, let’s say 4 cups of water and 2 Tbps baking soda, and then add your hazelnuts and let them simmer for 3 minutes. Drain under cool water as you peel the skins… You still have to individually sort of push the skins off of each nut, but it’s really really easy. Yum! And GF for me! 😉 A friend just reminded me of a recipe she shared with me a year or so ago (and I made them that day) that had ground hazelnuts in them. They were good. Me want cookie! Sue, I haven’t used hazelnuts in a while and I just spaced out and didn’t skin them or toast them. The cookies still tasted good, but they are better when you toast and skin the hazelnuts. Now that you mention it, I may splurge and order some skinned, blanched hazelnuts off the Internet. These are going to the top of my baking list. How do you deal with hazelnut skins? I LOVE hazelnuts but those darn skins are such a deterrent. I know different ways to deal with them but find all of them a hassle.